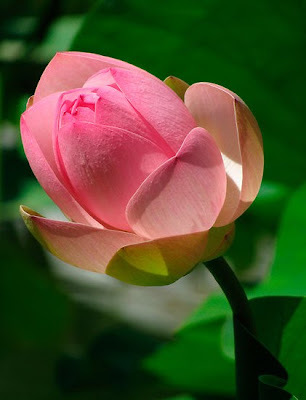 Lotus flower is frequently mentioned in the ancient Sanskrit Hindu scriptures, as padma (pink lotus), kamala (red lotus), pundarika (white lotus) and utpala (blue lotus). The earliest reference can be found in the Rg Veda. 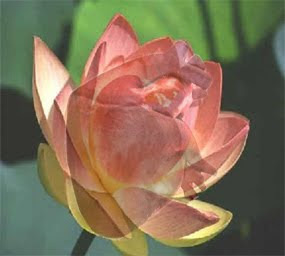 The lotus blooms with the rising sun and close at night. Similarly, our minds open up and expand with the light of knowledge. The lotus grows even in slushy areas. It remains beautiful and untainted despite its surroundings, reminding us that we too can and should strive to remain pure and beautiful within, under all circumstances. He who does actions, offering them to Brahman (the Supreme), abandoning attachment, is not tainted by sin, just as a lotus leaf remains unaffected by the water on it. From this, we learn that what is natural to the man of wisdom becomes a discipline to be practiced by all saadhakas or spiritual seekers and devotees. Our bodies have certain energy centers described in the Yoga Shaastras as chakras. Another Hindu version of creation portrays the emergence of the heavenly man, Purusha, from the mundane egg which grew about him after "desire first arose in It," thrilling life through the sleeping spaces to create the first differentiation. The creation of Vishnu followed: he slept on a lotus, and a lotus stem issued from his navel. In The Secret Doctrine Blavatsky says that the growth of the lotus from Vishnu's navel, as he rests in the waters of space on the serpent of infinity, illustrates the universe's evolution from the central sun, "the ever-concealed germ" (1:379). The waters are the womb of space and the stalk is the umbilical cord. Vishnu's consort and feminine aspect, Lakshmi, at her birth surged forth from the ocean standing upon the white lotus, which is her emblem. Goddess of wisdom, love, and beauty, she corresponds to the European Venus, who also was born by rising from the water amid flowers. Lakshmi is the symbol of eternal being. As the mother of the world, she is eternal and imperishable; just as Vishnu is all pervading, so also is she omnipresent.